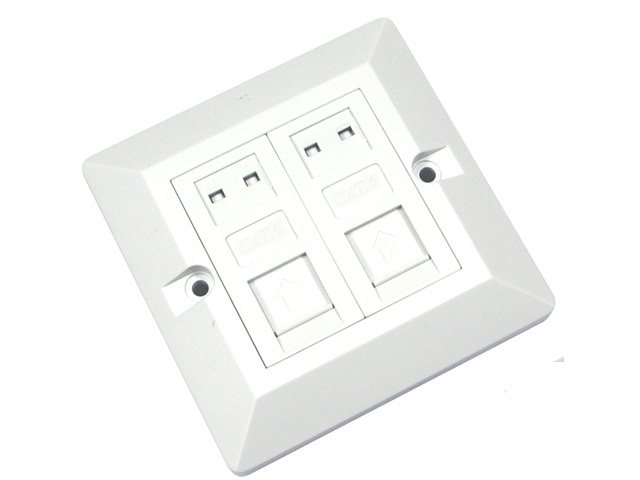 Double face plate for networking cables with RJ45 Cat 6 key stones. Fits into most single gang buttress boxes for wall mounting. Used when networking your home or office, for a neat professional look. Use solid network cable in walls and under floorboards etc. It s not as flexible but better for this type of usage, long distances and the best speeds. Where all the cables meet at the other end, use a patch panel for easy connection and simple future modifications. Fit the cable into the key stone with a push down tool (aka IDC tool) - each of the 8 connectors are colour coded. Leave the insulation on each of the 8 cables, as the keystone will pierce through them. It will also cut the cable off neatly for you. If mistakes are made, use the hook to pull out the cable and try again. Whether you are a confident fitter or a beginner it s easy to make mistakes. A network tester will inform you quickly and easily whether you have made a mistake or not. If it does not flash in order, it will point to the one that is wrong.